Did you catch us on QVC? Who’d have thought our wee homemade brand would be on TV, already!?! 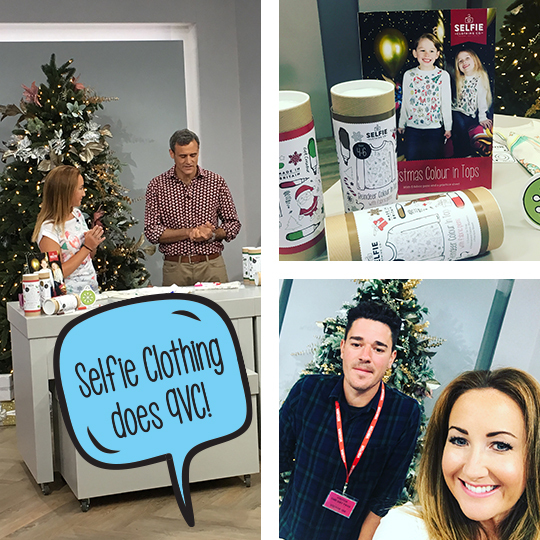 We got the call from QVC a year ago that they were looking to launch a craft area to target the very popular trend of ‘make your own’. One year later after much testing, re-designing and logistics, we went live. We launched on their Christmas in July show, yes people do actually buy Santa stuff in the summer as our sales that day proved. We have designed an exclusive range for them, a range consisting of three Colour In Tops: Santa, Rudolph and Elfie Selfie! Despite many, many, many pre-show nerves, doing the show was a blast – we had so much fun! We were given just six minutes to showcase and demonstrate the brand, and let us tell you, that six minutes felt like six seconds. We can’t wait until the 25th September when you can catch us again on the 11am show. Check us out and buy our exclusive Christmas Designs here.